Rath Yatra was today celebrated in various parts of the city with traditional religious fervour. West Bengal Chief Minister Mamata Banerjee inaugurated ISKCON's 44th Rath Yatra from its temple on Albert Road. The colourful chariots of Lord Jagannath, Balaram and Subhadra, pulled by thousands of devotees from India and abroad, moved through the major city roads amid the joyous chants of 'Jai Jagannath' and 'Hare Krishna'. The chariots moved through various roads of the city and reach the Brigade Parade Ground (Maidan) where it will remain till July 25. City Mayor Sovan Chatterjee, Trinamool MP and popular film actor Dev besides actress Koel Mallick, singer Indranil Sen were also present among others. The chariots would return to the ISKCON temple on July 26 on the day of "Ultarathayatra" (return journey). With Rathyatra and Eid falling on the same day this year, ISKCON authorities changed the yatra route in solidarity with the Muslim population and in order not to cause them any problem. 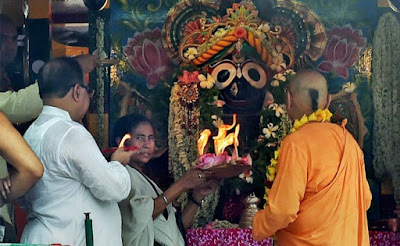 Over 15 lakh devotees from around 100 nations are expected to participate in this year's ISKCON's Rath Yatra, a functionary of the religious group said. During these eight days, several cultural programmes like dance performance of Dona Ganguly's group and Vedic songs by Russian devotees, are scheduled. Students pursuing Ph.D at IIT-Kharagpur's Electronics department would present a shadow dance on the essence of Bhagavad Gita. Chariot festivals were organised all over the city in which hundreds of devotees participated.